Produktinformationen "Whisky Couvreur - Intravaganza"
Dieser außergewöhnliche und besonders einzigartige Whisky Intravaganza aus dem Hause von Michel Couvreur, präsentiert sich mit seinen 50% Alkoholgehalt als ausgesprochen vollmundig. Der Intravaganza ist ein anmutender, jugendlicher Whisky, der in besonders alten Sherryfässern gelagert wurde. Seine Aroma ist von einer überwältigenden fruchtigen Süße sowie einzigartigen malzigen und karameligen Toffeenoten, der ideale Abendbegleiter. Probieren Sie ihn doch einmal leicht gekühlt als Aperitif, sie werden es nicht bereuen. Like a Clearach bottled at its natural strength.. ! 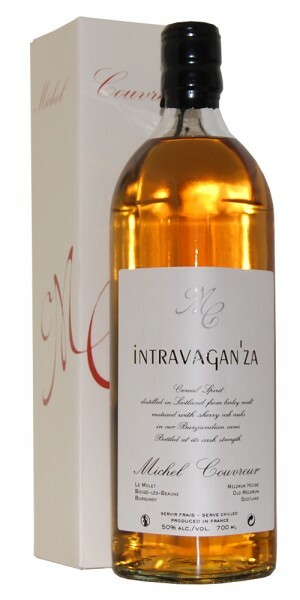 The INTRAVAGANZA is a single malt spirit distilled in Scotland and matured between 2 and 3 years in wine fresh sherry casks. Its bottled at its natural strength 50% alcohol by volume. Limpid gold amber tint.Typical to very young malts with almonds and frangipane (red jasmine) fragrance, nice grassy freshness with a slight touch of honey and wood. Lively and sharp in the mouth, its maturation in wine casks, despite its young age, is revealing some silky elegance. Unctuous tastes, reminding the spirit of pear which become finer and very floral enhanced by a note of smoke. To be consumed as an aperitif or as a Norman Hole (the traditional Norman intermezzo made of one single shot of strong Calvados between two heavy courses). Let him get warmer slowly in the balloon glass, it may disclose its depth...!